Last month Samsung teased a ‘4x fun’ reveal event. 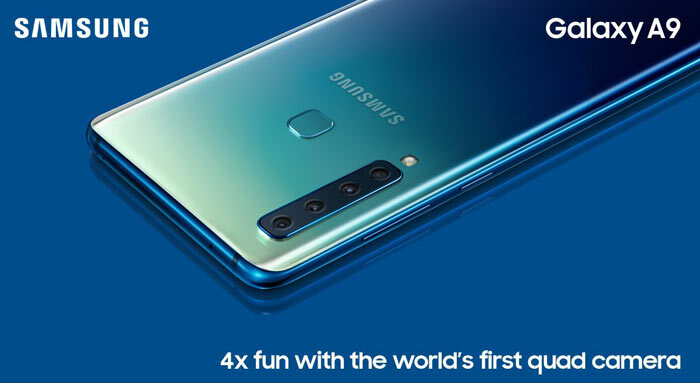 We guessed it might be referring to a 4x rear camera array equipped device, and that is indeed what was revealed in Kuala Lumpur earlier today as the Samsung Galaxy A9 was launched. 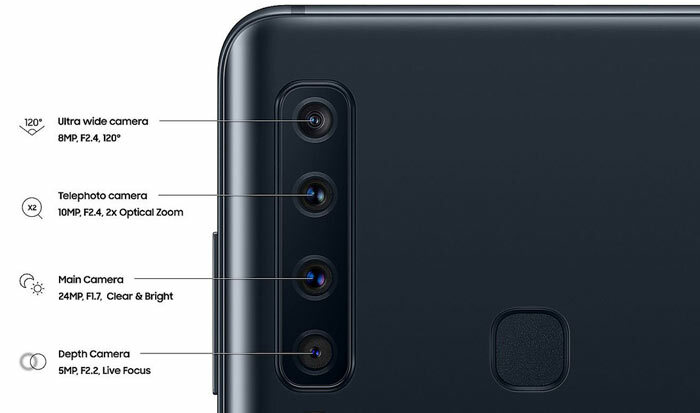 As Samsung crows on its news blog, the new Galaxy A9 provides the world’s first rear quad camera and is “packed with Samsung’s best camera innovations” for end user gratification. 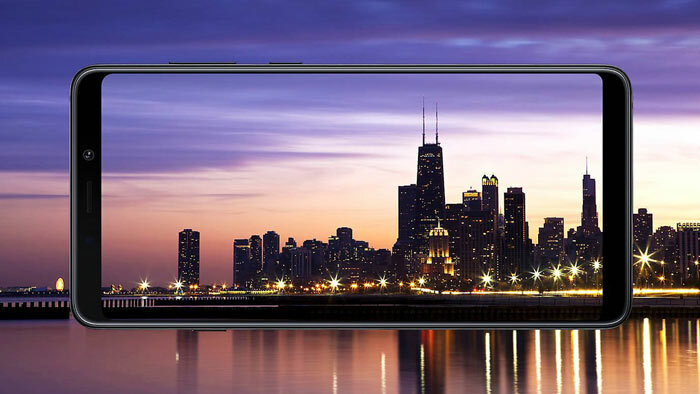 Before looking more closely at the photography credentials of this device, let us check over the supporting specs of this mid-to-high end smartphone. Samsung bases the design around a notchless 6.3-inch Super AMOLED screen with 1080 x 2220 pixels resolution. There are modest bezels to the top/bottom of the device front as held in portrait mode. Thanks to this construction the A9 measures 162.5 x 77 x 7.8 mm and weighs in at 183g but should feel comfortable in the hand with its 3D Glass curved back. Inside the Galaxy A9 you will find the Qualcomm Snapdragon 660 octa-core processor with 6GB or 8GB of RAM (varies depending upon operator/region). There is 128GB of built-in storage plus a micro SD slot to add up to another 512GB. This smartphone packs all the modern connectivity and sensors you might expect including LTE Cat.9, Wi-Fi 802.11 a/b/g/n/ac (2.4/5GHz), VHT80 MIMO, Bluetooth v 5.0, ANT+, USB Type-C, NFC (Samsung Pay compatible), Location (GPS, Galileo, Glonass, BeiDou), Accelerometer, Fingerprint Sensor, Gyro Sensor, Geomagnetic Sensor, Hall Sensor, Proximity Sensor, RGB Light Sensor. A “long lasting” 3,800mAh battery is fitted. That last sensor allows for depth effects like adjustable ‘Bokeh’. It isn’t clear how these cameras work seamlessly together, I’d assume the camera UI switches between lenses at various zoom levels, and all make use of the depth sensor for effects. Samsung says its camera software uses AI to recognise scenes and choose settings. Lastly, on the front of the phone, there is a selfie camera: 24MP, f/2.0. 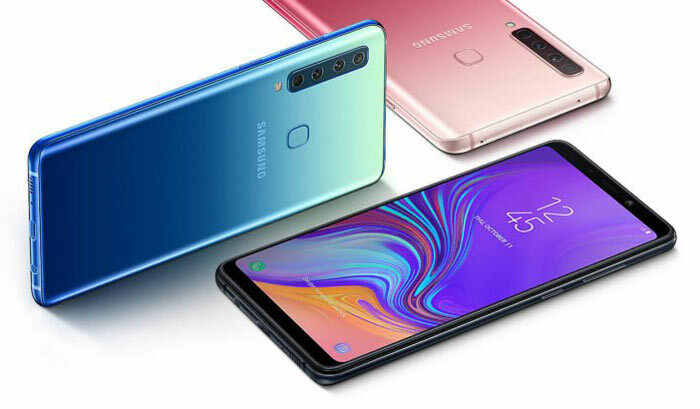 Samsung will make the Galaxy A9 available in three colours; Caviar Black, Lemonade Blue and Bubblegum Pink. In an email to HEXUS, Samsung said that the Galaxy A9 will become available in the UK from November priced at an RRP of £549. It ships with Android Oreo. Can i be the first to say that whilst its cool and everything to have 4 lenses, they look ugly the way they are styled into the case, kind of like those idiots that have to point out that there car is better because its got bells n whistles on it when compared to yours. Just looks a bit geeky to me. Did someone leave Gilette to go work at Samsung? The A series is now £550 - wow! More a rip-off. The SD660 is actually found in £300 Nokia 7 Plus and the sub £300 Xiaomi Mi A2. The One Plus 6 is also cheaper than this.